This week has seen our very first Me-Time Retreat here at The Royal Bridlington. ME-Time is just what is says - time for yourself to enjoy your own craft without the usual distractions of making meals, looking after the other half and family, the phone etc. It time for you to Chill and enjoy and be looked after with delicious meals and homemade treats. Of course everyone is very willing to help each other and offer advice should the need arise. Krys decided to work on quilting her sampler quilt for the three days. 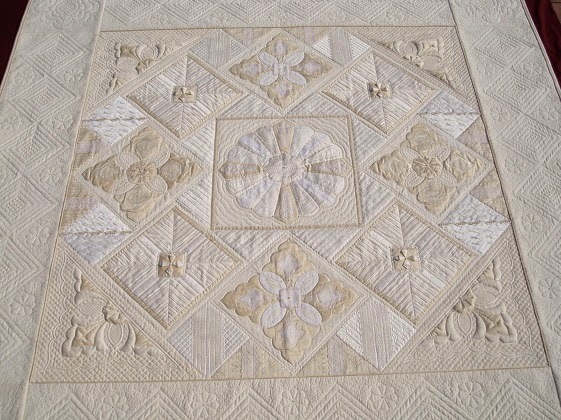 Sylvia worked on an Heirloom Quilt project similar to Pauline Ineson's quilt pictured here. Janet worked on various dolls which she is hoping to retail them at local craft fairs. Mary worked on a quilt which needed quilting and binding. Other ladies brought their knitting, cross stitch, and other patchwork projects. Personally I worked on several UFOS from the ever growing pile. I now have three quilt tops and backs ready for quilting, one finished quilt as you go bargello (except for binding to sew down) and a few more snail trail blocks for another. Our facilities are available for groups to organise their own retreats - just contact Fiona for more details - Tel 01262 672433 or click here to email. Details of our workshops and retreats can be found on our website http://www.quiltsandwich.co.uk along with my online shop for wadding & backing fabrics & details of my longarm quilting service.